The Big Wobble: Mystery as thousands of leopard sharks are dying in the San Francisco Bay this year. 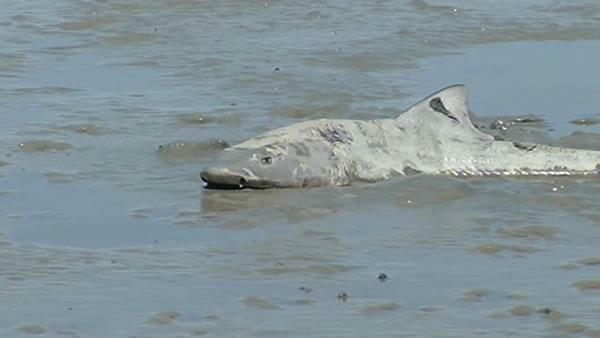 Mystery as thousands of leopard sharks are dying in the San Francisco Bay this year. Biologists are trying to figure out why thousands of leopard sharks are dying in the San Francisco Bay this year. Researchers tell the San Francisco Chronicle huge numbers of dead sharks have been found since mid-March along the shorelines of Redwood City, Foster City, Alameda, Hayward, Berkeley, Oakland and San Francisco. It is the largest die-off in six years of the striped fish, which is the bay's most abundant shark. Pelagic Shark Research Foundation executive director Sean Van Sommeran believes the number of dead and dying sharks in the bay could be in the thousands. It is the largest leopard shark mortality event since 2011, when more than 1,000 dead sharks were counted inside and outside the Redwood Shores Lagoon and along Richardson Bay, in Marin County. Experts believe the sharks are picking up toxins in stagnant saltwater.